The first step will to create a zero curve that reflects the current market data as of your valuation date. The easiest way to do this is to use the Resolution zero curve calculator. Select Templates in the Resolution menu, then Zero Curve, then Swap Zero Curve. Just fill in the rows with the market data that you have available. You might find our previous article on market data useful. There is a number of pre-built calculators to handle most types of swaps. They can be found by clicking on Resolution, then templates, then Swaps. For Vanilla or Bullet Swaps, no amortizing, single currency use the calculator named: IRS1 - Vanilla. For Amortizing Swaps, single currency use IRS2 - Custom1 These are particularly common when you are hedging a commercial loan or mortgage. 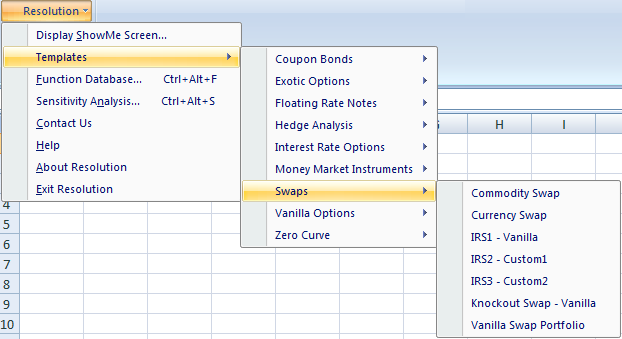 Once you have the calculator open, copy the zero curve results from the swap zero curve calculator to the swap calculator. Then, fill in the contract details into swap calculator. The valuation, sensitivities and cashflows are then calculated.